New colours, new logo, new stadium. More than that, in 2018 West Coast changed its approach to football, built on its strengths – and now they’re a four-time AFL premier. No one gave the Eagles much hope coming into the 2018 AFL season. They looked like the prototypical topped-up loser that would wither and die. Scrapping into last year’s top eight, then winning an away elimination final with a kick after the siren in extra time, the Eagles were not one of the best six teams in the 2017 competition. A year or two plumbing the depths and restocking with young talent looked in prospect. Even West Coast fans had no idea what to expect. Fortunately for them, coach Adam Simpson and his refreshed assistant coaching panel knew what they had and knew what it would take to keep the club relevant on the field. A ten-game winning streak after a Round 1 loss was far better than relevant – the Eagles were setting the pace. They did it with their legs. And in keeping with the strengths theme, the Eagles kicked the ball. Gone were the attempts to fix up a midfield lacking in pace and power. Instead Simpson had his team playing a style of football more in keeping with last year’s grand final loser – as a direct counter to last year’s grand final winner. The ball moved swiftly, but through the air, not on the ground. When it came off it was football at its idyllic best. The doubters doubted, as they always seem to when something that doesn’t conform to their preseason expectations comes to pass. West Coast’s dominant 47-point Round 9 victory over reigning premiers Richmond changed minds. The Eagles’ start to the season was real, and they were a genuine premiership chance. Finishing second on the ladder was a just reward for the team’s performance in 2018. For all the previous talk of the Eagles being ‘flat-track bullies’ – as sure a sign as any of a person with little intellectual value to add – West Coast was 8-3 away from Perth Stadium in 2018, racking up victories against GWS, Hawthorn and the Pies twice at the MCG in the process. Winning away is a challenge for every club, but one which is magnified for teams outside of the Melbourne bubble. The Eagles care not for your foolish labels. How did they do it? Evolution rather than revolution. 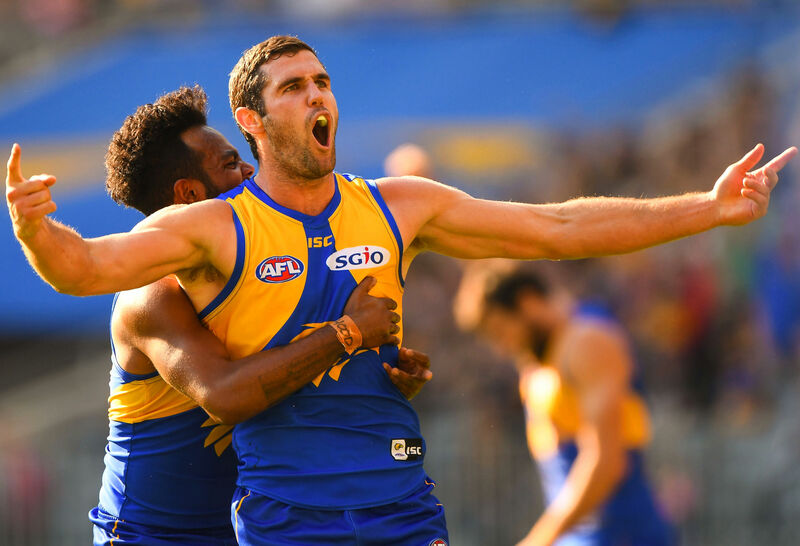 Simpson and his list management team made some surely challenging calls at the end of last season, including ending the careers of some champion players, such as 240-game Brownlow medallist Matt Priddis. In their stead came an injection of youth across the ground and in relatively minor roles around the established and hardened core. Consider this: just 12 of West Coast’s 2015 grand final 22 played today, and only 15 of them remain on the Eagles’ list. It has been a retooling, but a significant one, and it has won the club its fourth premiership. Change has been a theme of West Coast’s year. On 1 November the club unveiled its new logo (very modern) and team colours (a throwback to its early days). It obviously played its home games at a new stadium but had been spreading itself over training facilities across a number of venues, including the rapidly deteriorating Subiaco Oval. West Coast’s assistant coaching panel changed significantly from last season, and from the bits and pieces we’ve heard this week, the ethos of the team has changed since 2015. A club chock-full of young families, West Coast appears to have embraced the chaos of that life and bought the positive change in attitude it fosters to the way it goes about its business. From my experience anyway, you just sort of go with the flow, learn to take things a little less seriously and have clarity of purpose. It is a far cry from the culture the club created for itself just over a decade ago. Those dark days seem long gone, and it isn’t just club culture that has strengthened. West Coast, already the richest club in the land by way of accumulated equity, will surely grow richer on the back of both a larger stadium and the lucre that flows with a premiership. The Eagles are a serious commercial enterprise masquerading as a public trust, and that has played a far more important role than anyone from within or without the club may care to admit. Consider the Eagles have now won four premierships in the AFL era, the second most behind the three-peat Hawks, and have appeared in seven grand finals over that time, equal with Geelong. That comes despite the disadvantage of having to travel outside of its own state every other week. That would be a damn sight more difficult to achieve were it not for the stability and strength of the club’s administrative arm. But more importantly perhaps is the manner in which West Coast has managed its list. Managing the turnover from 2017 is impressive, but it goes further. When Nic Naitanui went down with his second ACL tear in Round 17, that was supposed to be it. When Andrew Gaff had his moment of madness, that was supposed to be it. These are two of West Coast’s most important players, but critically are two of its most highly paid. Even if Naitanui’s cap hit isn’t quite the $1 million that’s often quoted, it would be close. West Coast has built a premiership-quality list without much production from its highest-paid player. It has managed to win three games in September without its most important midfielder. These are the sorts of blows which should prove fatal, particularly for a team that convention says should be in a transition period. But the Eagles have overcome them, built on its strengths and stand here today as the best team in football. Not bad for a flat-track bully.